Coe's Golden Drop is a traditional yellow English plum, with a very good rich sweet gage-like flavour, but some balancing sharpness. It is widely regarded as one of the best-flavoured of all English plums. 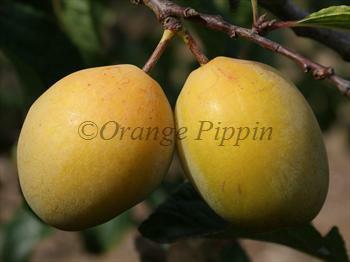 The attractive yellow free-stone plums are valuable for both dessert and culinary use. This versatility, combined with its excellent flavour and large size make it a particularly desirable plum tree for the keen fruit grower. Please fill in the details below and we will let you know when Coe's Golden Drop plum trees are back in stock. Descended from Coe's Golden Drop, good flavour and easier to grow. Keeps fresh in a fridge longer than most plums.? Coe's Golden Drop is in flowering group 2. Coe's Golden Drop is self-sterile and needs to be pollinated by another tree of a different variety nearby. Coe's Golden Drop is not as easy to grow as most plums. It is quite fussy about its situation - it does best in a sheltered location or trained on a south-facing wall. The tree is generally healthy and can be quite vigorous on good soils. Cropping is very variable - it is best to assume it will be light, although if the tree likes where you have planted it then cropping can be very good. This is essentially a variety for the plum enthusiast, who will, in a good year, be rewarded with perhaps the most refined of English plums. Raised by Jervaise Coe, a market gardener from Bury St. Edmunds, Suffolk, England, at the end of the 18th century. Mr Coe stated that it was seedling tree, most likely from an Old Green Gage stone pollinated by a White Magnum Bonum plum tree growing nearby.